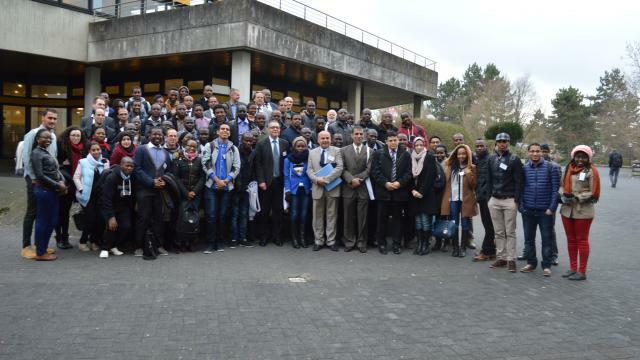 From 19 March to 2 April, the second cohort of students of the Pan African University Institute of Water and Energy Sciences, including Climate Change (PAUWES), attended a Spring School plus two laboratory courses in water/energy and a workshop in energy in Germany organized by the Institute for Technology and Resources Management in the Tropics and Subtropics (ITT) at the TH Köln – University of Applied Sciences, the Center for Development Research (ZEF), University of Bonn, and the United Nations University Institute for Environment and Human Security (UNU-EHS) in partnership with the Deutsche Gesellschaft fuer Internationale Zusammenarbeit (GIZ) and the German Academic Exchange Service (DAAD). During these two weeks, the 48 African students were given the opportunity to receive training from highly qualified faculty members and had access to the state-of-the-art facilities of the German partner universities. In addition, the students visited significant sites for the water and energy sector, including a biogas plant, the experimental DLR Solar Power Plant in Jülich and the historical hydro power plant of Friedrichssegen. The program also included a visit at the German Federal Ministry for Economic Cooperation and Development (BMZ). Cleus, Student Representative Energy Policy Class, 25, from Uganda, said, “There wouldn’t have been a better opportunity than to spend my spring break at the ITT. The spring school and workshop were indeed worthwhile not only adding to the practical knowledge but getting the grasp of the latest energy management technologies and software as well as the life in Cologne where people don’t wait for the perfect moment but rather take the moment and simply make it perfect”. Dr. Erick Gankam Tambo first of all introduced UNU-EHS as well as the EduSphere section. Then, Dr. Matthias Garschagen represented the Vulnerability Assessment, Risk Management and Adaptive Planning (VARMAP) Section. In the framework of the joint PAUWES-UNU-EHS Webinar series, two other UNU Institutes, the Institute for Integrated Management of Material Fluxes and Resources (UNU-FLORES) and the Geothermal Training Programme (UNU-GTP) were also involved. Dr. Ana Andreu from UNU-FLORES delivered a remote lecture on “Water management in drought-prone areas” and Dr. Ludvik Georgsson from UNU-GTP presented: “Geothermal systems – types, exploration and development” and “Geothermal energy – status and future possibilities”. Both webinars included a subsequent discussion with Q&A session targeting student opportunities for research and practical experience such as internships in particular. Diana, Water Policy Student, 25, from Rwanda, stated, “I especially enjoyed the free interaction with the professors and more so the research students. The field trips proved that well implemented technology and participation of stakeholders can work to make life better in water supply, treatment and sanitation. I also enjoyed immersing myself in the culture and history… I loved every moment and thank everyone involved in making the trip a success”. Further activities involving the private sector, including an International Fair, are scheduled in Tlemcen from 28th-29th May. Learn more about the PAUWES project.